There are some things that just drive me crazy! 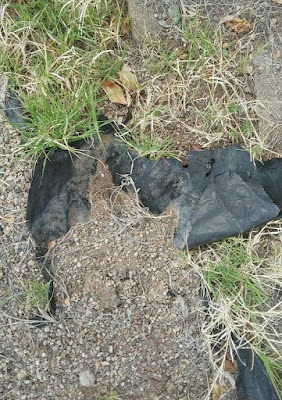 Like...why are there still patches of lawn in the Tucson desert? And those little rocks that get caught in your sandals – gravel! I understand why people put gravel in their yards. I don’t want to spend all weekend weeding either. 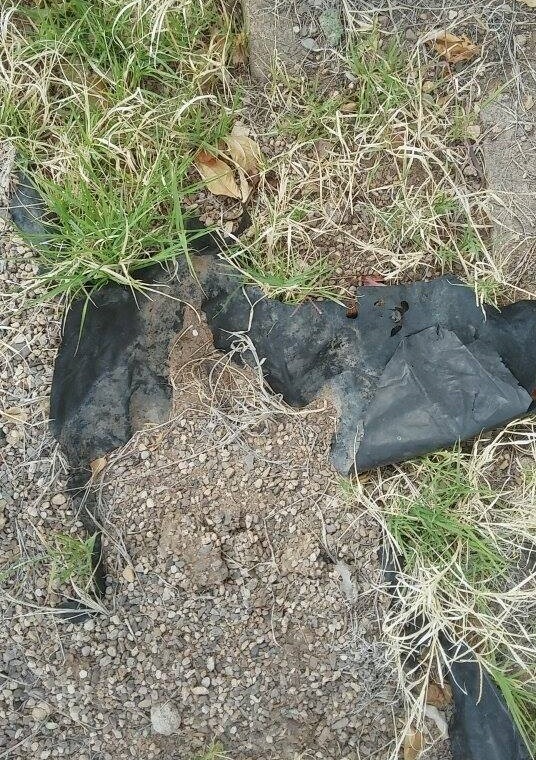 But if you look at the sun cracked, gravel covered plastic we use to tame it, there are signs of life (weeds) breaking through. When some people think of the desert, they think of dirt. But our dirt is brimming with untamed life. When I first came to Tucson, I was amazed by all the green in our desert: our famous saguaros, prickly pears towering over roof tops, agaves with stalks resembling giant asparagus, and cholla cactuses lining the horizon like furry puppies glowing in the afternoon sun. (Don’t try petting them though!) Twisted and gnarled Mesquite and Paloverde trees grow amok. This time of year wild flowers speckle the ground. The desert hums with bees pollinating brilliant cactus blooms. Our tough desert plants are adept at storing water for the long dry spells. There are seasons when our desert has an overabundance of water. In the spring, icy water bounds down the Catalina Mountains into rushing rivers and streams. During Monsoon season, our washes rage and overflow. Not enough of this water sinks into our aquifer, because the caliche ground has turned hard from inconsistent rain. Instead our precious rain water is collected in city streets to be polluted with automobile oil then left to evaporate on its way out of town. Lack of foresight and understanding have left us with no infrastructure to retain the water for our daily use. Miles and miles of cement aqueducts bring us water from the Colorado River. But we are beginning to see how vulnerable that supply is as poisonous tailings from long abandoned mines leak into Colorado’s rivers reaching as far as our own Lake Powell. It wasn’t always like that. 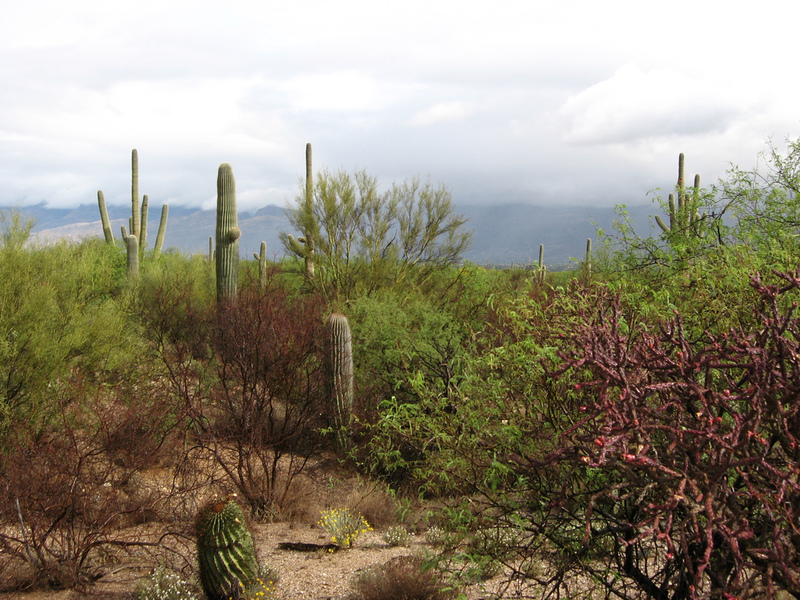 Tucson is one of the oldest settlements in the country. 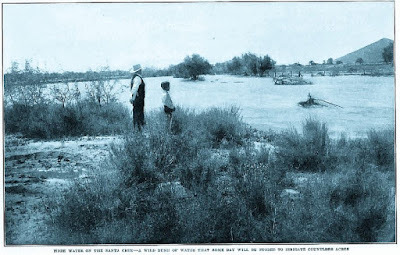 Native Americans and Mexicans settled here for the abundant Santa Cruz river water. The Hohokam, expert desert farmers, created an elaborate irrigation system connected to the river. They captured rainwater with rock dams and storage tanks. 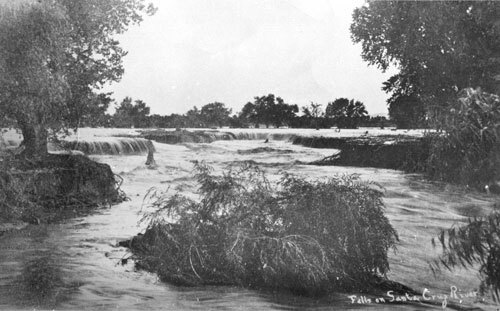 The Tohono O'odham crafted earthen dams and brush weirs to divert water from washes to crops. There was a riparian habitat with abundant trees and animals. It wasn’t that long ago that our rivers and streams flowed year around. 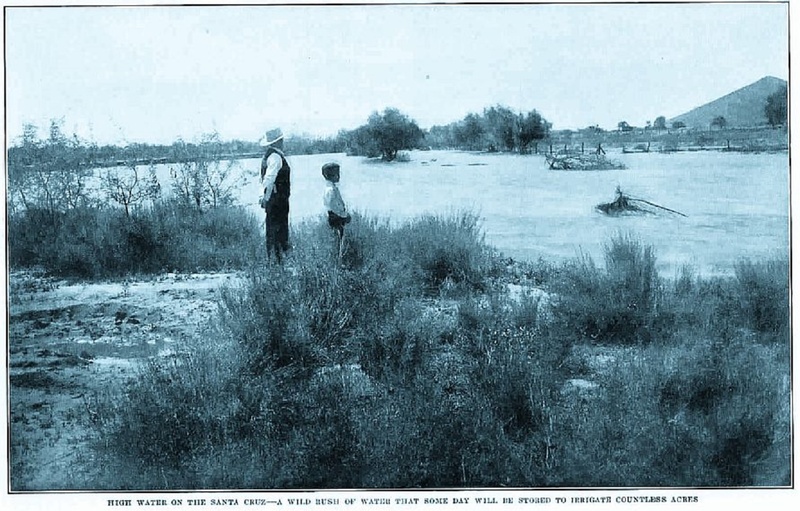 Old time Tucsonans still reminisce about playing in the river as children. This was before bad management, over-pumping and drought depleted our ground water and turned those rivers into dry river beds. It was before cement and gravel covered the earth. While our city council commits time and money into redeveloping downtown, they neglect to invest in our dearest resource – rainwater harvesting and management. Hope is budding around the desert like native wild flowers. 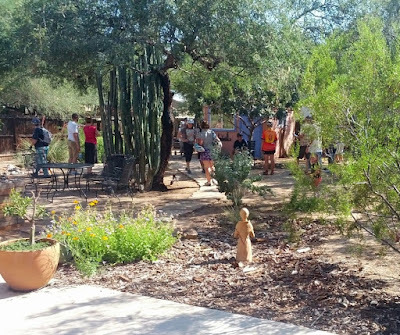 Nestled in nearby neighborhoods are shady desert oases boasting colorful native flora and fauna. Some are nourished with rainwater runoff from roofs or gray water from washing machines. Water is diverted into the yards using berms and rocks to direct the flow to catchment basins where water soaks into the ground to nourish plants. 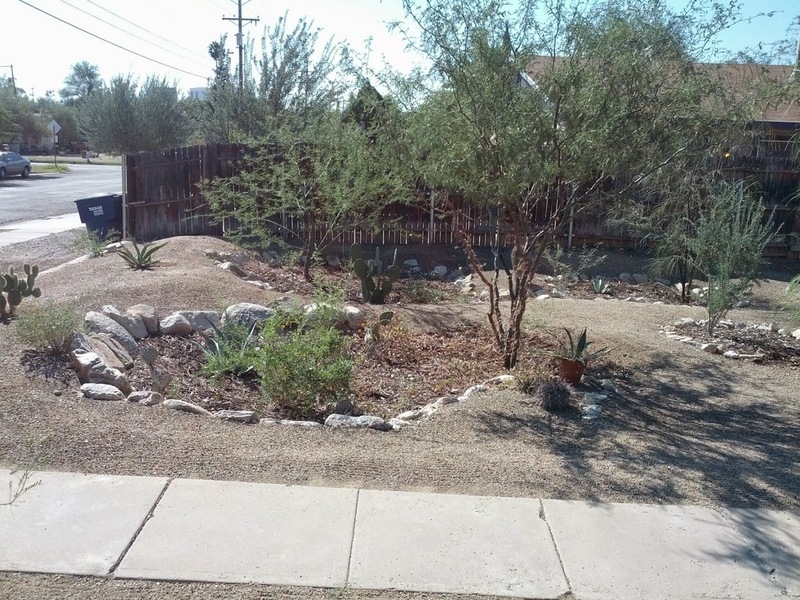 Tucson’s own Watershed Management Group is inspiring local homeowners and businesses to develop more sustainable landscaping. All this might seem overwhelming, but the WMG is here to help. They offer free classes on rainwater and greywater harvesting. You can learn more by taking their field studies courses. You can get started on creating your own desert oasis by joining their coop and working on other people’s yards. When you accumulate 19 hours, the volunteers will work on your yard for free (not including the cost of materials and consultation/supervisor.) 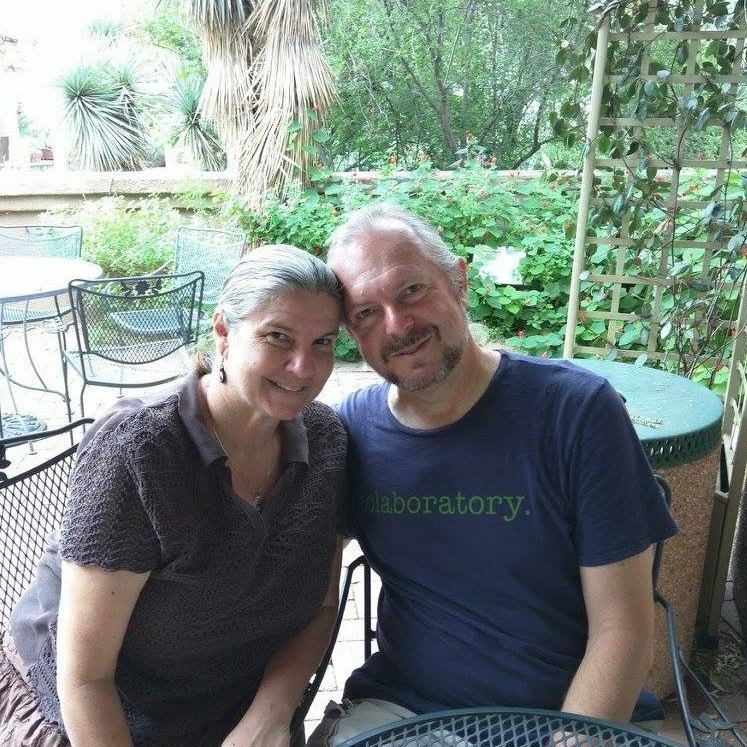 Dan and I have started the process by taking classes and joining WMG's coop so we can transform our own yard using rainwater and greywater harvesting. Organic mulch and native grass in catchment basin allow water to seep into the ground. One of the most incredible things we learned in Watershed Management Group’s classes is that we can all play a part in refurbishing our ground water so the Sabino and Tanque Verde Creeks will flow into the Santa Cruz River once again! There are signs of positive change throughout the city. Tucson Water offers rebates for homeowners to install rainwater harvesting and graywater systems. The city is taking baby steps towards better water management. While there are still patches of grass by the Old Courthouse, there are also curb cuts to water native trees outside of the new County Public Service Center. 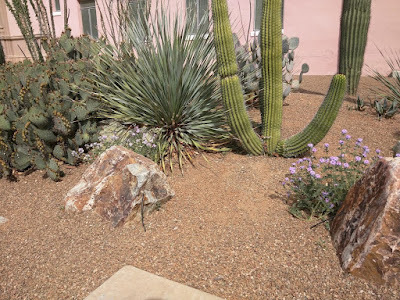 The city recently planted desert landscaping around the Old Courthouse. But instead of berms and catchment basins, they use emitters to water it. We found two of the emitters watering decorative boulders. Well, they're trying. They need to hire WMG as a consultant! 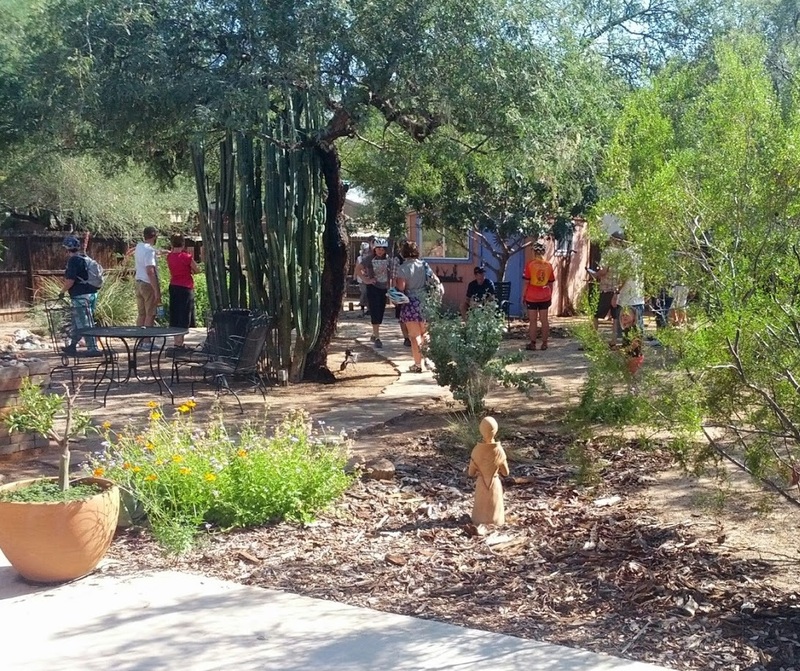 If we dig up all that boring gravel and enhance our rustic desert landscape with rainwater harvesting, we can play a part in replenishing Tucson’s groundwater so we can enjoy flowing rivers surrounded by flourishing Cottonwood and Willow trees. Boring gravel is right. Nothing surpasses God's creation. Why do we ruin it? How to get the HOA's on board?